Executed at 3 flagship store windows, Pepe jeans promotes its offering in custom made denim wear (in forms of laser, ripped effect, tattoo, painting, embroidery etc) through a simplistic window and in-store VM presentations where sewing accessories play an interesting part of the display. Spanish denim brand Pepe Jeans has recently executed a new window and in-store VM campaign revolving around the brand’s offerings on custom made denim. 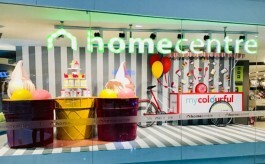 The window and in-store VM have been executed at 3 flagship stores in total across Delhi, Mumbai and Kolkata. The in-store VM takes the window concept forward by displaying the sewing and laser cut accessories, as part of store display. 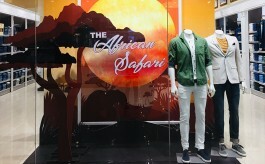 Mumbai-based VM agencies Khan enterprises executed the windows and VM works for Pepe Jeans India.